There will be two choices. You may choose to write TEST A on Thursday April 18th AND then write TEST B after the Passover break. Our Fractions Test will be on Tuesday, April 30th. Including all Proper, Improper, Mixed and IN LOWEST TERMS! Mr. Ray and I are joining forces for a bit to help support you with designing, planning, and creating your own Kiddish Cup using the Blender Software and 3-D Printer! Here is Mr. Ray’s rubric for your project. 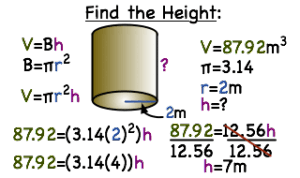 To find the area of a cylinder you need to multiply the area of the base x the height of the cylinder. 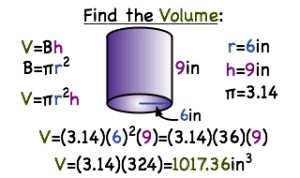 To help you find the volume of your internal cylinder. Here is a video (same from class) to help. Also, don’t forget if you are provided the required volume in oz. You need to find a conversion to cubic centimeters. You can find an online conversion calculator here. Once you have the volume required in cubic centimeters, now you are ready to work backwards to find your heights and radius! How? Here’s a helpful sheet to help you work backwards! Today we began our new unit on Fractions. Do You Remember Page 285 (Show what you know!) DUE THURSDAY! If you do not know: TRY and share that with me! and where I need to conference and support you in this unit. REMINDER! SJCC Scale Model and paving costs (with tax) are due by Friday! Tomorrow is your Integers Test. Please use the sheet I passed out today for reference and a study sheet for tonight’s studying. No Homework Tonight! Sens Night! No New Assigned Math Homework tonight in grades 6, 7, or 8! Grade 8 DOES have homework from last week that is due tomorrow and a test on Wednesday! As we discussed in class, homework will be becoming more nightly as we prepare our minds and workloads for grade 9! To prepare for the Integers text next Wednesday, and due to Sens Night Monday night, the following questions are DUE TUESDAY APRIL 2nd! If you have been provided workbook work, this will be your homework in lieu of the above. Still due Tuesday! If you have a workbook, please complete the pages and questions assigned in your workbook for Thursday. Next Friday March 29th, we will have our unit test on Integers. Your study package is due before Friday. Earlier if you want more feedback from the teacher about how you are progressing.